26 cm 399 p. : col. ill. This definitive collection from the undisputed queen of cakes brings together all of Mary Berry's most mouth-watering baking recipes in a beautifully packaged edition. Filled with 250 foolproof recipes, from the classic Victoria Sponge, Very Best Chocolate Cake and Hazelnut Meringue Cake to tempting muffins, scones and bread and butter pudding, this is the most comprehensive baking cookbook you'll ever need. Mary's easy-to-follow instructions and handy tips make it ideal for kitchen novices and more experienced cooks alike, and full-colour photographs and beautiful illustrations will guide you smoothly to baking success. 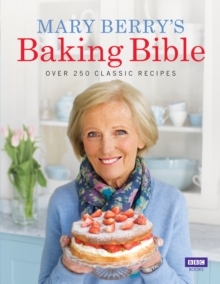 Drawing on her years of experience to create recipes for cakes, breads and desserts, Mary Berry's Baking Bible will prove to be a timeless classic.